I know I should have done this a long time ago, but I finally got my hands dirty with Travis CI. 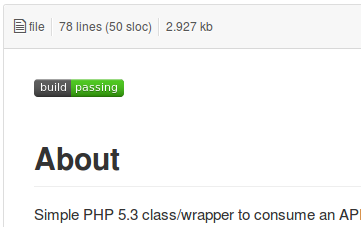 I wanted to set up a php project on github to use Travis CI to monitor the status, in case I forgot to run the tests prior to pushing. Unfortunately it was not as easy as it’s made out to be. But now that I’ve done it once, it’ll be easier next time. So, here is how I tackled it. First, creating an account and getting started was easy. I simply clicked the “sign in” link on the Travis CI site and entered my github credentials which authorized Travis CI to connect to my account. (the site informs you exactly what Travis CI will have access to) Once that’s done Travis gets all my repos, so I can then activate them for Travis CI. If that doesn’t happen automatically there is a handy “sync now” button to coax Travis CI. NOTE: To connect public repos you would use https://travis-ci.org, while for private repos you would use https://travis-ci.com. While pubic repos are free private ones cost money, though you do get 100 pushes free to get you started. 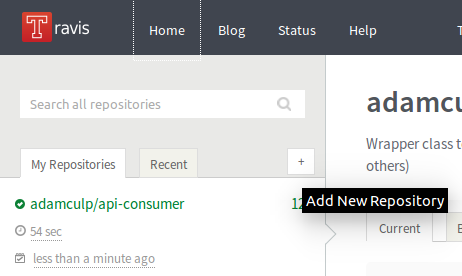 Second, it’s now time to click the + and add a new repo to be tracked by Travis CI. After clicking you will be presented with a list of your repos to choose from. It is simply a matter of turning the repo ON by clicking the switch. I also clicked the wrench to select the option to “Built only if .travis.yml is present”. Third, I needed to create the .travis.yml file with the directives needed to make it all work. Here is what my file looked like. Pretty simple. 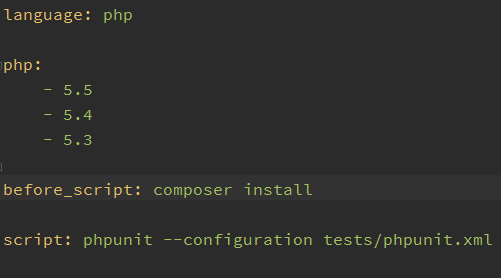 Here is what it all means: I specified what language to use (php), and what versions of the language to test with (5.3, 5.4, and 5.5), I also instructed to have Composer install prior to any other scripts run (needed to ensure there was an autoloader, created by Composer), and finally I add the phpunit command and tell it where to find the phpunit.xml file (in this case it was in the tests directory). The phpunit.xml file is fairly simple. 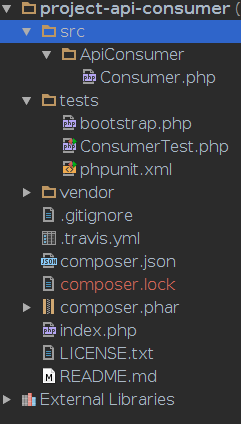 It informs where PHPUnit can find the bootstrap.php file (same directory as a the phpunit.xml), and sets a whitelist of directory where code can be found (some use a blacklist and specify not to use the /vendor directory), and what directory to find tests in (the current directory). The bootstrap.php file specified by the phpunit.xml file is even simpler, as it only specifies where to find the autoload.php file created by the Composer install. Fifth, take a quick peek at the settings for the repo on github and you will notice that Travis CI should be already set up and ready for something to be pushed. 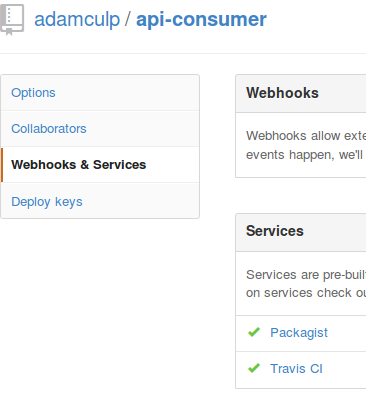 One last thing you may want to do is add the Travis CI image to your README.md at github. 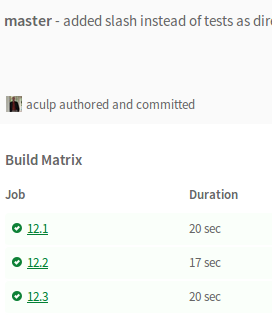 This will allow you and others to see whether the current master branch had a successful build, or if it failed. The way OpenCFP was set up, using Composer, meant that PHPUnit was already placed in the /vendor directory as a requirement in the composer.json. So rather than taking the lazy way out and using the PHPUnit already installed globally on my system, I wanted to use the latest PHPUnit within the project. This requires 2 setup steps in PHPStorm. To start I needed to inform the IDE where to find the Composer autoload file and leverage the awesome PSR-0 goodness to autoload PHPUnit in the /vendor directory. To do this I open the Settings via the icon on the toolbar, or by using the File->Settings menu item, or hitting the Ctrl+Alt+S keyboard shortcut. Then in the Project Settings (top section) I expanded PHP to get the PHPUnit dialog. Now I had to add a Run/Debug Configuration for the project. I did this by clicking on the toolbar dropdown and selecting Edit Configurations. 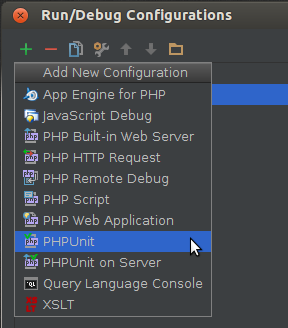 Once the dialog opened I clicked the “+” to add a run configuration, and select the PHPUnit type. All done!!! 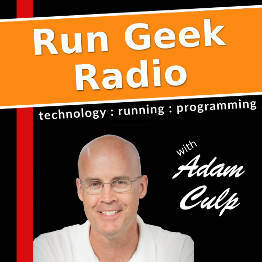 Now I was able to run the tests simply by selecting the new run configuration defined in the dropdown, and clicking the Run button in the toolbar.